It was the kind of heist that makes legends: back in the final days of the War Between the States, Old Barton La Croix and his gang stole $100,000 in gold from a Union Army convoy. The blue coats caught up with Old Barton, but they never found the gold and it slipped into legend… until the fateful night two gangs converged on the Deadwood Cemetery to find out if the gold was buried with Barton in his grave! That was the set up for the Gutshot game, “Grave Consequences,” run by Gutshot co-creator Mike Mitchell at the first Winter WarFAIR game day hosted by Little Wars game store. MEDIUM RANGE FOR A RIFLE SHOT... TO THE HEAD! Brook Burg checks the distance for a called head shot as Adam Gesser looks on. 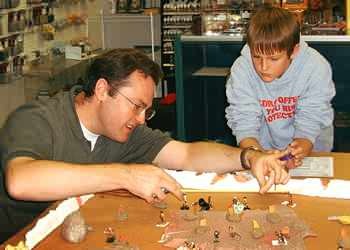 Five players joined Mitchell around the game table that Saturday evening with dice in hand, ready to sling lead. Three of the players were no strangers to the game: Dion Duran and his son, Diego, were part of the notorious “Little Warriors” gang who had plagued the West during last Summer’s campaign. And Brook Burg had thrown dice in a “Last Man Standing” game at the “Gathering of the Tribes” game day back in April. New players Kevin Connelly and Andy Gesser were also on hand for the evening’s action… which turned out to be a bit different from previous games. “Grave Consequences” marked a serious departure for the game, Mitchell revealed. “Very early in the creation of Gutshot, my partner and game co-creator, Mike Murphy, and I had long discussions about the direction we wanted to take this game. We both agreed that we would eventually create material to play Lone Ranger type games with masked heroes (shooting guns out of hands, slashing the letter “Z” on someone’s chest, and all that fun TV and pulp-era daring-do),” he said. “We also decided that we didn’t want to introduce werewolves, monsters, and other supernatural creatures. There’s already a Deadlands game, and we certainly don’t see the need to duplicate their efforts. Shotgun Dirk takes down Eagle-Claw Bob in a battle to the death... and beyond! It started off as a simple game of two outlaw gangs fighting each other in a cemetery. There were 15 graves on the board and they had to search each one, while dodging the gunfire of the other gang, to find Old Barton’s grave. It took the players three Turns to find it, during which time three of the gang members were killed (and one grave digger who made the mistake of opening his door to someone with a shotgun). Once the grave was found, however, the gates of hell yawned open and the dead burst from their graves to defend the gold. And, more chillingly, everyone who had just died got back up and was ready to fight again! 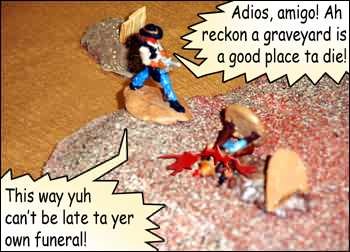 Zombies rose to defend the buried gold in Boot Hill as the specter of Old Barton La Croix hovered over his own grave, daring the gunfighters to face his wrath. 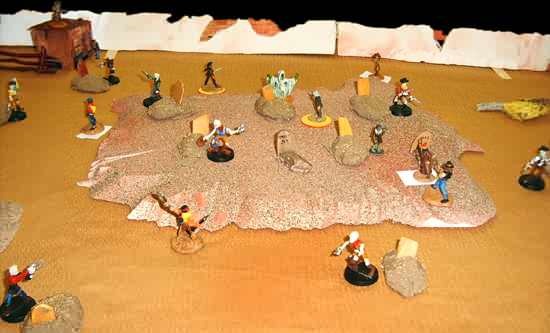 “OH, COOL!” shouted Adam when he saw the undead gunfighters placed on the game table. The other players had similar reactions. The game continued at a brisk pace as Mitchell playtested the rules unique to this situation. That was actually one of the most difficult and heated aspects of the debate behind this adventure, Mitchell revealed. Aside from testing the special rules mentioned above, Mitchell was particularly concerned with finding out how tough his zombies were when fighting in the “real world” of a game convention. Find out who lived, who died, and who got revenge from beyond the grave! Adding the one shack to his just-completed Boot Hill (see Mike’s Workbench for more details about this new terrain) really proved to be useful for the players, he observed, as it gave the Characters a place to fall back and hunker down against the siege of undead that threatened to engulf them. Mitchell said he will continue to playtest the rules a few more times before releasing a preliminary PDF of the adventure online for public download. Right now current playtests include an unspecified date in January and another playtest at the upcoming OwlCon game convention in February 2006. More details will be posted as they become available.